Although the city was selected last year to hold that title until 2018, will be now, from 27 February to 1 March, when exercising its first "reign" more intensively, in occasion of the Mobile World Congress 2012. 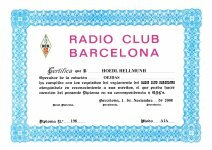 Spanish radio amateurs like to celebrate this with an special event station on the air thanks to Ràdio Club Barcelona, EA3RKB. The contact is also valid for EANET Award. Members of FEDI-EA and/or EURAO: automatically will receive it via EuroBureauQSL. Needn't to send their own QSL.